Santo Domingo is the capital and largest city of the Dominican Republic. It is among the most popular cities worldwide. The city has an outlet on the exotic Caribbean Sea and is built at the mouth of the Ozama River. It is believed that Santo Domingo is the most lively and colorful town situated around the shores of the Caribbean Sea. Santo Domingo is the first place where Europeans began their colonization. Therefore it is in the Dominican Republic that town guests can see the first cathedral and the first military fort built in the new world. A top tourist attraction is one called Colonial city. The place really is the first city built by colonizers. It is located between Park River and Ozama River. The area is protected by UNESCO. There is also the first built by Europeans street - Calle de Las Damas, around which are many historical buildings. Each city sightseeing tour usually starts at Columbus Park - the site attracts residents and visitors with beautiful tall trees, sometimes working fountains, friendly pigeons and of course the many historical sites located around it. In the center of the square was erected a huge bronze statue of Christopher Columbus. The park is located opposite the oldest cathedral in the new world - Catedral Santa Maria. The majestic building was built in 1514. In the design and implementation of the religious temple were involved many people with different views of the followers of different schools, so now it looks like a well-balanced combination of many different architectural styles. 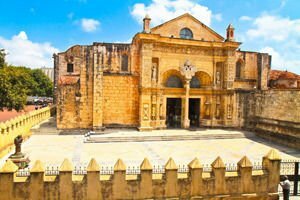 In the colonial area are the remains of the first monastery in the Americas and one of the most ancient Franciscan monasteries, built in 1508. Ozama Fortress is again among the sights that can put "first" to its name. It's the oldest still preserved military fortress, located in America. 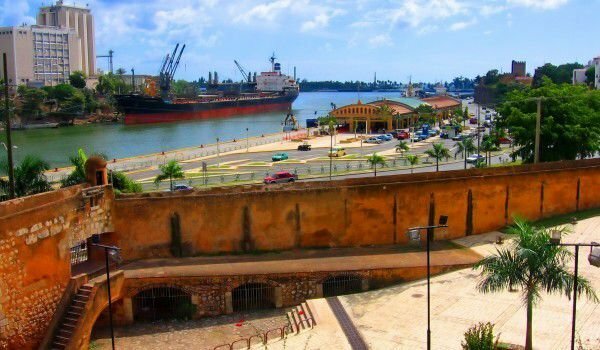 The purpose of the building was to protect the port of Santo Domingo. Alcázar de Colón, or Columbus Alcazar is another landmark is the Dominican Republic. It is the oldest residence of the colonists in the world. Among the beautiful modern buildings in Santo Domingo is the National Palace, which houses the offices of the executive. The beautiful palace was designed by an Italian architect. Museums of Santo Domingo are located in Plaza de la Culture. Columbus Lighthouse and the National Aquarium also deserve special attention. Attractions in Santo Domingo are the great variety of restaurants and night entertainment. Locals argue that even for them it is difficult to visit all. One of the nicknames of the Dominican capital is the "city that never sleeps." In addition, there are excellent conditions for shopping. The world's largest retail chains are represented in Santo Domingo. In the Dominican capital are many designer shops, which often make reasonable discounts. The oldest commercial street in town is Calle El Conde. It is located in the heart of the so-called colonial zone. The place is an open shopping center where you can find a variety of items. The Dominican capital's population is about 2 5 million. The town was founded five centuries ago by the brother of Christopher Columbus - Bartholomew Columbus. 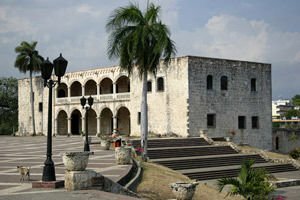 As seen, Santo Domingo is the first place where permanent European settlers in North and South America stopped. It is the first seat of the Spanish government in colonizing "New World". It is believed that Making the Americas begins right here. East of Santo Domingo, about four hours away, lies the resort Boca Chica. To the west are the beach areas Palenque and Nizao, as well as the largest caves around the Caribbean – the Pomier Caves. North of the Dominican capital are other picturesque towns -Bonao) and Jarabacoa.